Looking for educational posters about recycling to hang up at drop-off locations? How about tip cards to pass out at your next community or college fair? Or information to include on your website? Browse our communication resources, add them to your website, or download them for free to use to educate your community about plastic film recycling. Add your program information, city logo, and more to our posters and tip cards. Click here for instructions on printing our posters. Display this badge on your webpage to inform residents not to put bags/wraps in curbside collection and to find a local drop off. Simply copy and paste the code at right into the HTML of your site. Please do not alter the code or image. Find out what plastic bags, wraps and film can be recycled. 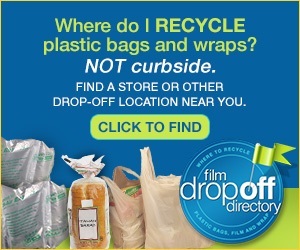 Learn where to recycle your plastic bags, wraps and film!